Molnari's rotor for the Molnari GT Gyrocopter. If you are sick of waiting in traffic or waiting to go through toll booths, or you simply want to have the time of your life, the Molnari gyrocycle/gyrocopter is for you! 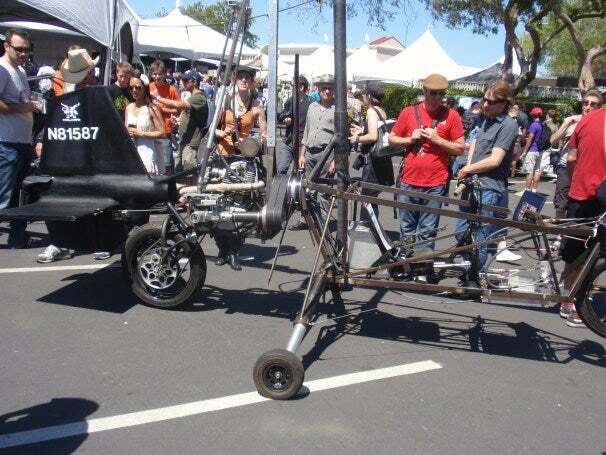 Making a scene at the Bay Area Maker Faire this past weekend, Molnari--a licensed automaker (that means that the company can print its own VIN numbers)--showed off working prototypes of street-legal aircraft. 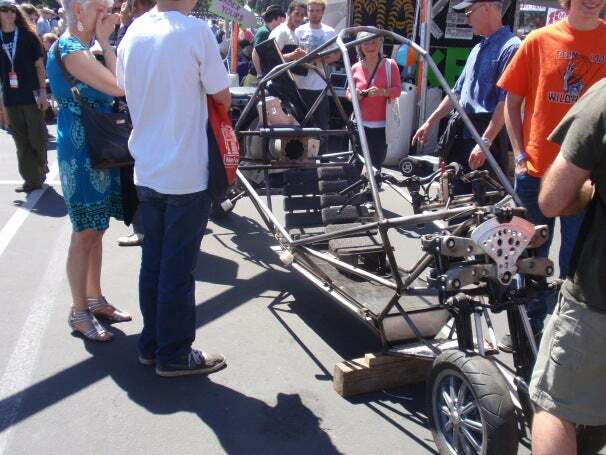 Molnari had two prototypes on display at Maker Faire. The first, seen after the jump, is the Molnari G2. 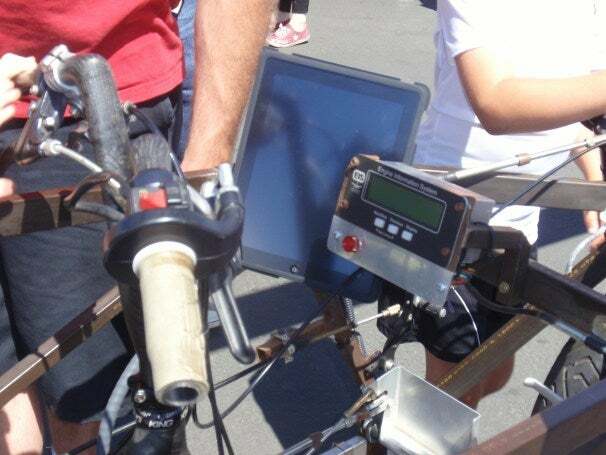 This vehicle can cruise--as a "gyrocycle"--at about 105 miles per hour on the freeway and give you about 250 miles of range. 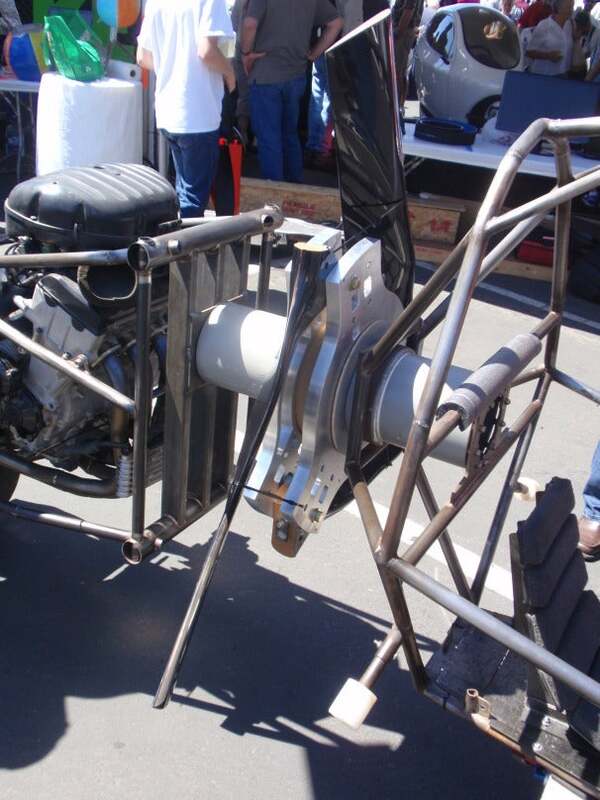 Alternately you can convert it into a gyrocopter (which has an unpowered rotor--unlike a helicopter--and a powered propeller), which lets you cruise a bit faster with about an 80-mile range. 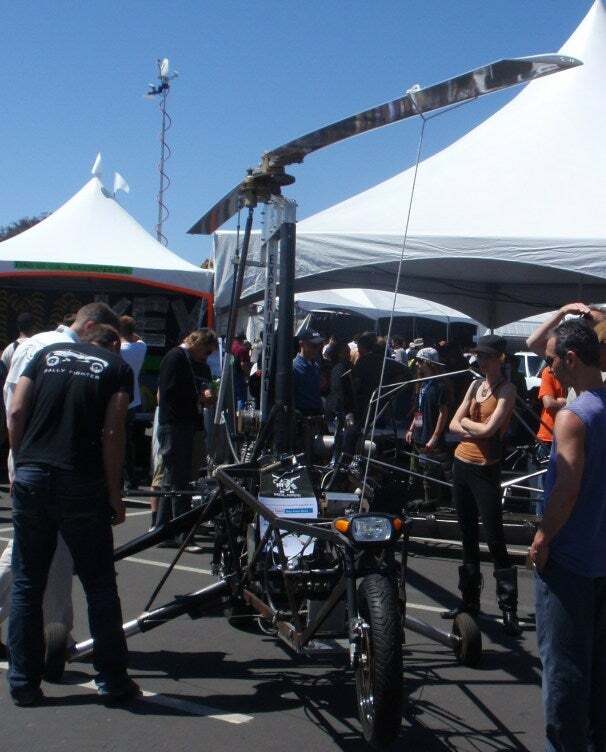 This prototype was built in 2005 in only 5 months, and has been flying since 2006 between about 2,000 and 3,000 feet. However, it can theoretically fly to about 10,000 feet. The Molnari G2 from a different angle. The G2 is capable of using any computer system for navigation. The second prototype, running since 2007, is very similar to the G2, but with a couple differences in the design and rotor blades. This prototype has an approximately 800-mile range on the ground and about 250 in the air. 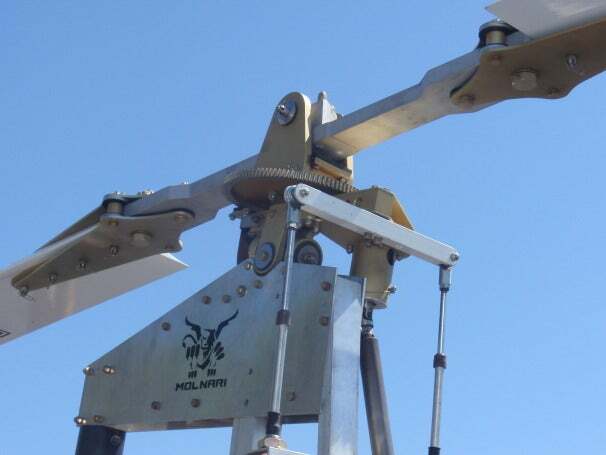 Molnari's latest patented propeller system. Dezso Molnar, the creator of Molnari, explained to me that the price of these vehicles will be lower than what most would think because the company does a lot of its manufacturing in-house. According to an interview with Coast to Coast AM, these vehicles will be priced at around $100,000, which really isn't bad, considering that a Tesla could cost you just as much. Mr. Molnar also said that in order to fly one of these, all you'll need is a sport plane license or private pilot rating, which you can get with as little as 20 hours of flight experience. Exactly when the Molnari will be available is still up in the air, but for now Molnar plans to show off one of the vehicles by driving it across a part of the US this summer, which will surely garner some support.